Most Irish people believe Pope Francis did not do enough to address clerical abuse during his recent visit, researchers have said. 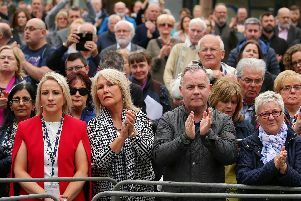 QUB researcher Dr Gladys Ganiel said: “Francis’ visit to Ireland has revealed a lot about how people in Ireland think about the Catholic Church. l 80% did not attend any of the events surrounding the papal visit, 51% because they were simply not interested and 30% said they disagreed with how the Church has handled abuse.